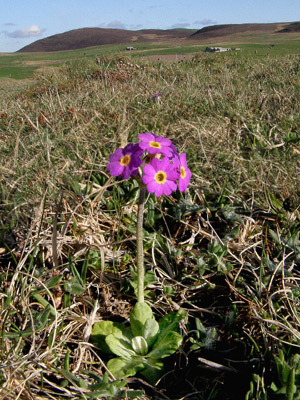 Primula scotica is a tiny, deep purple flower - in May we found it when we visited the Orkney Isles, growing in short grazed grassland near the coast - it is always within a mile of the sea. 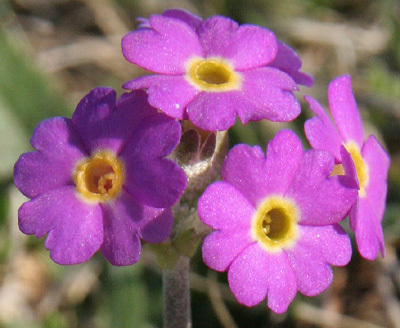 Primula scotica is found only in Scotland north of Wick, and in Orkney, It is smaller than P. farinosa, and the flower colour much deeper. It perhaps arose as a hybrid between this which is now extinct in Scotland, and P. scandinavica. 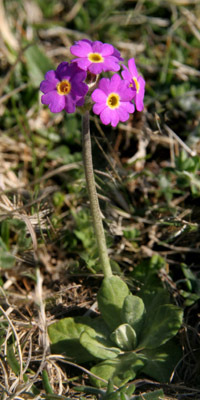 The Scottish primula is now itself on the endangered list. It is very choosy about its habitat, unable to compete with taller vegetation, and dependent on rabbits and sheep to keep the grass short.